At Techcare7, we strive to be the front runner in innovation and creativity in POS/ERP software development. We as a IT company understand the importance of our client's requirements and its influence on the best desired output. Customer support on go with live chat and email. Dedicated server for software with Database log backup and 99.99% uptime. Manual changes in bills on URGENT requirement support. GST solution including TAX RETURN friendly reports and custom billing solution. Works for both individual and franchisee/retail chain model. Secured programming - Our software comes with 128 bit SSL certificate that secures your data and is best designed for Google Chrome and Firefox browser. Usable for single licence, franchisee model and retail chains. Automatic purchase entry from master panel sales in franchisee model system. 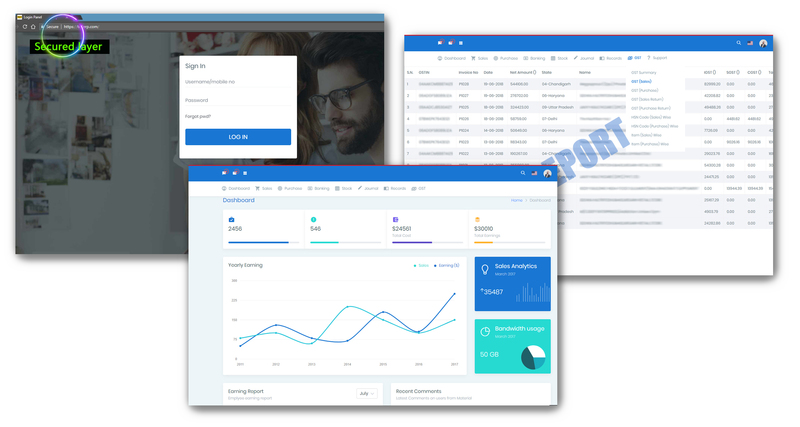 Customisable reports according to customer needs. GST tax return easy reports for GST R1 and GST R2. Fully featured dashboard with balances, graph, sales/purchase stats, reports and much more. Invoice format with discount / Item search / MRP / barcode / customer mobile search.